“Everyone is on a Dutch cycling high after VeloCity 2017” tweeted Australian cyclist/journalist Michael O’Reilly yesterday. If you could see my Twitter Timeline you would understand he hit the nail on the head with that remark. What a wonderful week it was for so many people! 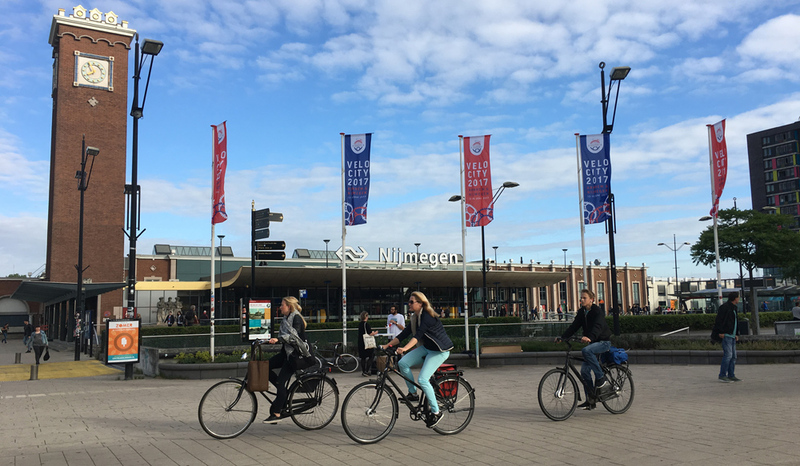 The global cycling summit in the Netherlands was a big success and a feel-good boost for many who (re)visited the Netherlands, but also for the Dutch themselves. Velo-City flags and ordinary people cycling in Nijmegen. King Willem-Alexander arrived to open the conference on Tuesday. To my knowledge it was the first time a head of state opened a Velo-City Conference. It surprised many that the king did not say a word. Apparently royal protocol dictates that the king either says something or does something. This time it was far more important that he came to do something: ride a bicycle. He rode it, part of the way, to Arnhem on the fast cycle route. The king was surprised when he found out what type of bicycle the organisation had chosen for him: “a back-pedal brake! That is a long time ago!” he exclaimed just after he mounted the bike. 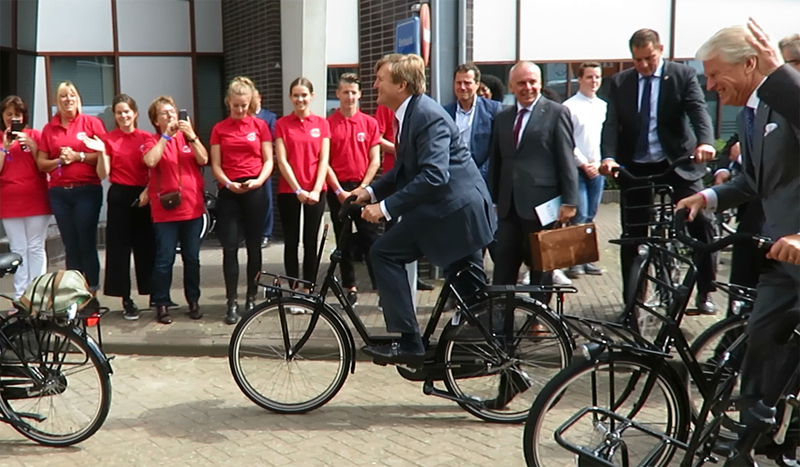 King Willem-Alexander is not used to a bicycle with a back-pedal brake. But he was able to ride it effortlessly. That the king was there is a clear indication of how serious the Dutch take cycling. Further indications were the high number of high-ranking officials who were also there. Among others, the mayors of Arnhem and Nijmegen, the alderman for traffic of Nijmegen, the Director General for “Accessibility” (Bereikbaarheid) of the ministry of Transport and the Environment and last but not least the minister of that same department. 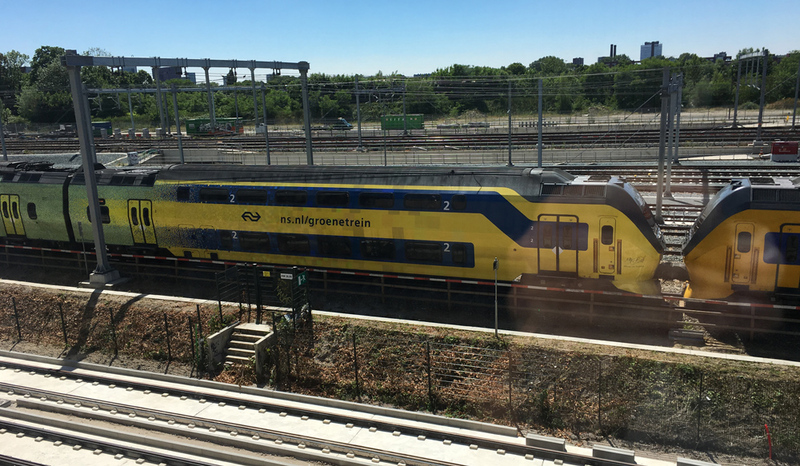 The special train from Nijmegen to Amsterdam passed the window of my workplace in Utrecht. Minister Melanie Schultz van Haegen held an impassioned pro cycling speech on the opening Tuesday. It surprised many when later that same week she criticized Amsterdam’s plan for a cycle bridge over the IJ. She said the projected bridge would only be attractive for people who’d also love to climb the Mont Ventoux. A big exaggeration since the new bridge would only have to be 11 metres tall to allow container ships with 4 stacked containers to pass. (Making it just 2 metres taller than the Utrecht Daphne Schippers Bridge.) Usually when people inflate their story this way there is a reason. The minister would prefer a cycle tunnel, because the government has just spent 1 billion euros to enlarge the docks near IJmuiden for tall ships to be able to reach Amsterdam, to improve business opportunities for the Dutch capital. The minister won’t be able to stop the Amsterdam bridge though. Brian Deegan, London-based cycle planner and engineer, now gets what was meant with “the Freedom of Cycling”. 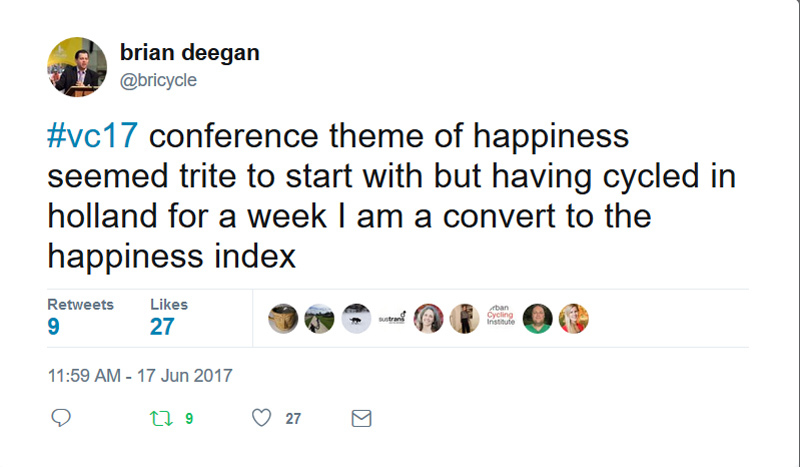 It is interesting to see that some people only grasped the full meaning of the motto of the conference “The Freedom of Cycling” after they had been in the Netherlands for a week: “#vc17 conference theme of happiness seemed trite to start with but having cycled in Holland [sic] for a week I am a convert to the happiness index” is what London-based cycle planner and engineer Brian Deegan tweeted. This year’s global cycling summit was one that broke records. The organisation reported there were more than 1,500 delegates, over 260 speakers, 107 sessions in two conference halls and an added 60 outdoor sessions or excursions. One of the excursions was a trip with a special train to Amsterdam. There, 700 delegates chose to “be an Amsterdammer for a day”. I had to work that day, but I saw the train pass my workplace in Utrecht. Not everyone was happy that the conference changed location for half a day, but I think it was good the delegates got to experience the unbeatable combination formed by the train and the bicycle. A viable alternative to the car, also for longer distances. Just one of the many sessions. 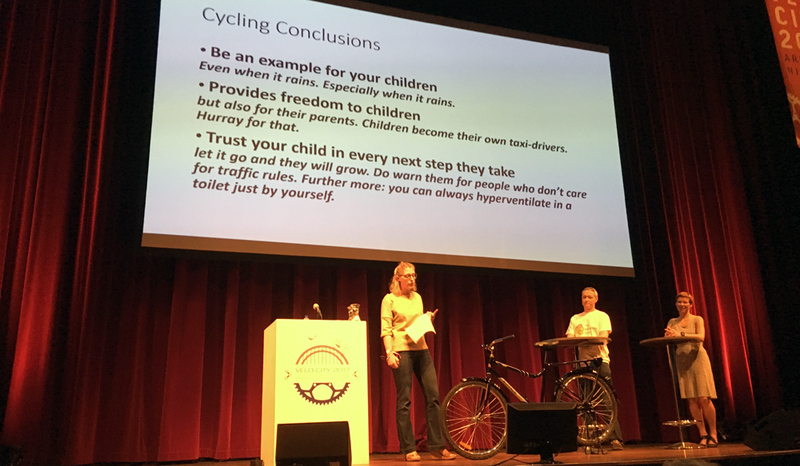 Here the topic was children cycling in three very different societies. Of course, the Netherlands is not always a Cyclists’ Paradise. The street both venues were on was a testament to that. The traffic circle of Keizer Karelplein could serve as a monument to the era of the private motor car. I found the traffic volume and the noise it creates very a-typical for the Netherlands. So it was good there was a bicycle tour through Nijmegen that showed the delegates another side of the city. I am not entirely sure how long that tour was, (I’ve seen reports about the distance varying from 12 to 16 kilometres) but I personally could have done with a shorter tour. (Video of the full tour.) It was of course nice to see so many people enjoying themselves. 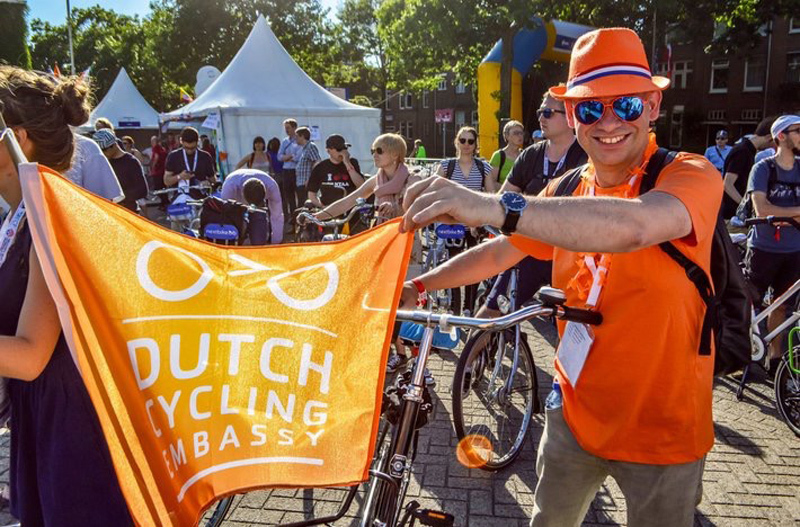 I was proud to represent the Dutch Cycling Embassy with a Dutch orange flag that matched my hat, T-shirt and sun glasses. It is impossible to get into the details of the many sessions. I saw quite a number and the topics were very varied. I chose some that dealt with the future of cycling: children. We need to get children to take up the bicycle. They were the key to the success of Dutch cycling, they could be the key to improving cycling in other countries too. If cycling is safe enough for a child, it is safe enough for everybody. The conference drew a lot of attention from the Dutch press. No matter who I told where I had been this week, every Dutch person had heard about Velo-City. This may be very good for cycling in the Netherlands too. That we should be proud of what we have achieved so far is what people got to hear. But there is still a lot of work to do, even here and we should take that work up with more vigour at some locations. Hopefully some decision makers were made more aware of that now. EU Commissioner for Transport Violeta Bulc received a suitcase with recommendations for a EU Cycling Strategy. On the closing day, another high-ranking official played an important role. EU Commissioner for Transport, Violeta Bulc, received a suitcase with the EU Cycling Strategy Recommendations from the hands of the Secretary General of the European Cycling Federation, Bernard Ensink. A team of the ECF had prepared these 11 chapter long recommendations with the input from approximately 1,000 stakeholders (NGOs, academics, businesses and cities) from 37 countries. The recommendations are directed at the EU, and decision makers on a national, regional and local level. If implemented, they will improve conditions to get more people cycling and this will lead to enlarged co-benefits and an added value of cycling in Europe. Bulc told the audience: ‘Be careful what you wish for, you’re gonna get it.’ A promise that she would study the contents of the suitcase carefully and use the 2 years until the next European version of Velo-City in Dublin in 2019, to come with a concrete plan. This week’s video is a longer look at the four-day conference. 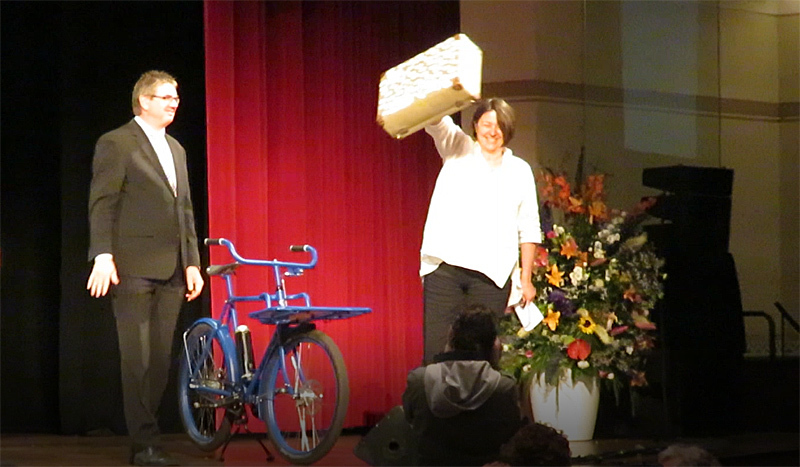 Finally, the mayor of Rio the Janeiro received the Velo-City bicycle from both mayors of Nijmegen and Arnhem. Rio will organise the next summit: Velo-City 2018. It meant the 2017 version was closed with a bang: a mini Brazilian Carnival. I’ve recently decided to buy an electric assist bike and have pretty much made up my mind to buy a Gazelle. I got somewhat curious to see what the e-bikes designed for the U.S. market were like. Here’s a offering from Trek that is a e-bike with a top speed of 28-mph, the legal speed limit for a e-bike in the U.S. is 20-mph. This makes me wonder what the ideal top speed is for an e-bike. The faster you go, the greater the risk of a collision and more serious injuries. A 20-mph speed limit seems about right. Trek does have a point that a bike should be more competitive with a car, although at 20-mph a bike comes pretty close to the average speed of a car from point A to B on a city street. Overall, I find the Gazelle bike much more practical for utilitarian riding than any bike I’ve seen that was designed specifically for the U.S. market. Riding on the frequently rough roads in the Los Angeles area leads me to want suspension and the Gazelle has it front and rear. Bikes designed for riding on the road in the U.S. rarely have suspension. The fact that Gazelle still makes all of their bikes in the Netherlands is surprising. All but the most expensive bikes designed for the U.S. market are made in Taiwan or China. Actually, e-bikes that can go up to 28 MPH are legal here in California, but IIRC, they’re not allowed on Class 1 paths and a helmet is required. However, the Dutch also reclassified those e-bikes to be “fast mopeds” this year and they now require a yellow license plate, helmet, and insurance in The NLs. Would someone mind making those awards conditional on always pushing forward and not resting on their laurels? It’s very pleasing to hear the conference went so well and that so many good messages were picked up on by the attendees. Let’s hope the EU’s “warning” comes true, and all of Europe becomes like the Netherlands for cycling and living conditions. Who knows, then the ideas and required actions might successfully make it all the way down here to Australia! Thanks for this report, Mark. As always, very much appreciated. U.S. cities have not reached the quality or quantity of bicycle infrastructure that the Netherlands has, but there is progress being made. For example, on the June 17th Bike Talk podcast that I provide a link to below, a city of Los Angeles traffic engineer, a planner and also a consultant discuss Vision Zero, a program to reduce serious traffic injuries and fatalities and also the My Figueroa Project, which involves the installation of bus stop islands and bicycle traffic signals in the creation of a protected bike lane. At 55 minutes into the audio, LA traffic engineer Tim Fremaux goes over the cost differences between various types of bike lanes that have been installed in the city of Los Angeles. Tim previously mentioned in the podcast that it costs at least $300,000 per intersection to retrofit bicycle traffic signals to an existing traffic signalized intersection. There are over 20 signalized intersections along the 3 mile route of bike lanes to be installed on Figueroa St. That’s at least $2 million per mile for bicycle traffic signals. That’s 2 million per mile if you retrofit an existing route in good condition. But what if it’s not? In The Netherlands, roads are typically completely overhauled every 30 years or so: underground facilities like sewers and cables have to be replaced, new traffic signals and installations are placed, lamp posts and trees might be replaced, etc. That’s an excellent time to rethink the road layout as well: do you need as many lanes? Can a bike lane be fitted? Is more or less parking for cars and/or bikes required? Can trees be added? Etc. After that, new pavement and driving surfaces are laid down. In case of such redesigns, it’s interesting to see what the price difference is between a design with and without cycle facilities. I doubt you would end up on 2 million per mile, i assume it’s a small fraction of that. It’s difficult for cities in the U.S. to just maintain the streets. A director of the U.S. department of transportation under the Obama administration described the nation as one big pothole. The city of Los Angeles director of the Bureau of Street Services estimated that it would take at least 15 years to bring the streets to a average good condition if they were able to obtain the maximum amount of money that they could use per year, which is an additional $100 million. Even with a upcoming large increase in the money available for transportation in the city of Los Angeles it will take many years to make a noticeable change in the way people move around in LA. Why does it cost $300k to retrofit existing signals? That’s usually the cost to add signals to an intersection without them, but I can’t understand why adding new heads costs the same amount. Taking the train for half a day was I think a good thing today. The whole concept of multi modal travelling is still in its infancy or non existent in other countries. When I am in The Netherlands I thoroughly enjoy the bike-train combination. Seeing the experience first hand is better than anything else. 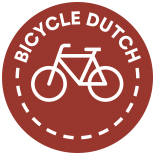 This entry was posted on 20 June 2017 by Bicycle Dutch in Original posts and tagged Arnhem, Nijmegen, Velo-city.